As many of you will know, since returning to the UK in 2011 I’ve been itching to get back to Japan. In particular, I’ve been keen to explore the Tohoku region (東北地方) which, to date, I’m afraid to say I haven’t visited. 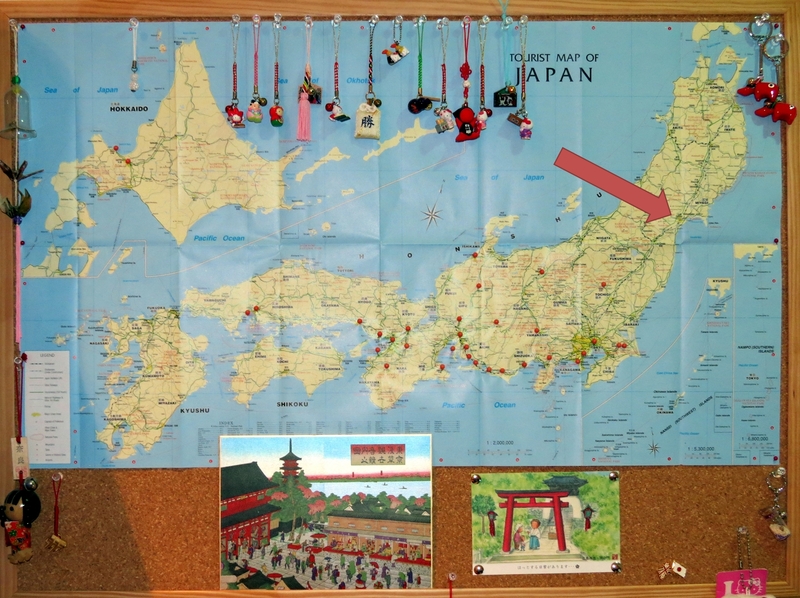 As you can see from the photo of my pinboard below, I’ve explored a fair amount of central Honshu, but there’s still so much more left ‘unpinned’. For the last couple of years I’ve thought about how and when I’ll be able to go back to Japan, and it has seemed at times like it might never happen. However, I’m absolutely thrilled and delighted today to announce that I will be visiting Japan next year! I’ll be going for work mainly, but will also be able to tag on some holiday, and that’s when I’ll be heading up north to Tohoku. My dates aren’t fixed yet, but it’s likely to be sometime in May. I honestly can’t wait and I’m absolutely bursting with excitement, but I have a lot of planning to do between now and then to make sure I get the most out of my trip. So, this is where you come in! I already have quite a lot of places in mind that I would like to visit, but I’d like some more suggestions from you, dear readers. Where have you been, and what would you recommend doing? What in Tohoku is absolutely unmissable? I want to discover new things, meet local people, try the food and buy the crafts (definitely kokeshi!). So, you tell me… what should I do? Excellent news! Let me know if there’s anything in particular you fancy seeing! Thanks, Sutefu! There’s so much I want to see!!! I went to Tohoku in May as well. If you get to go during Golden Week (in early May), then you can catch the cherry blossoms! Thank you! I was going to refer to your blog anyway – I know there’s a lot of useful stuff on there! I expect I’ll get there a bit late for cherry blossom, but I’m not sure yet. I recently show a semi-allergic reaction to cats as well all of a sudden, but that only is bad in a cat café. Cat Island is an open space, I didn’t have any issues. Maybe you can also hop onto Hokkaido to still catch the cherry blossoms then. Yes, I definitely want to go to Aizu-Wakamatsu! In Tohoku, I’d recommend Matsushima (one of the 3 most beautiful views in Japan), Naruko onsen, Hiraizumi, Kakunodate, and Yamadera. I’ll definitely be going to Naruko Onsen! !